High Voltage Surges created externally by thunder storms and spikes caused by switching operations in electrical supply networks are capable of causing large scale damage to electronic equipment. 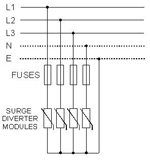 Switching large motors and normal plant operations can generate low level voltage spikes. Sensitive electronic equipment exposed to frequent low level spikes may result with erratic equipment performance and premature equipment failure. ESE recommend installation of two levels of surge protection to protect sensitive electronic equipment from internally or externally generated voltage spikes. ESE uses heavy duty, high kA rated Surge Diverters as Level 1 Protection and fast response medium kA rated Surge Diverters as Level 2 surge protection.